Two new bridges along the Don Valley bicycle trail are slated to open on June 1. The approach to the new elevated walkway from Ernest Thompson Seton Park. Closeup of the elevated walkway. The new elevated walkway underneath Don Mills Road. The junction of the elevated walkway and the Bailey Bridge. Note the pedestrian-positive graffiti on the Bailey Bridge. 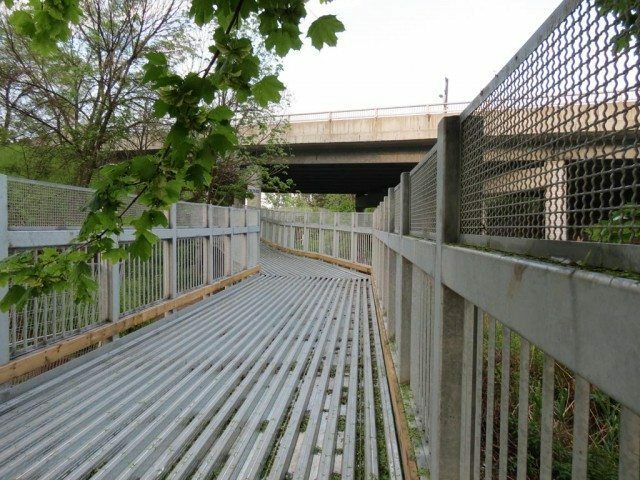 Good news for cyclists who use the official City trails in the Don Valley: barring weather-related disruptions, on June 1, you’ll no longer have to take alternate routes to detour around the construction of two shiny new metal bridges by Don Mills Road. Last August, the City closed access to the Bailey Bridge crossing the CNR/GO train line east of Don Mills Road and the wooden walkway leading to it from Ernest Thompson Seton Park, as well as the connection in the park between the Don and Taylor Creek Ravine trails. The official City detour suggested a lengthy route through Thorncliffe Park and the Leaside Bridge [PDF], but many cyclists have used simpler, if not always legal, workarounds. Those options range from a worn dirt path leading to the mountain bike trails in Crothers Woods to sneaking through the construction fencing to cross the track at train level. The project was scheduled to wrap up in March, but the unstable nature of the soil under the walkway caused problems. “Fill and crap” is how a Parks official described the mix of soil along the slope to us. While it was fine for supporting the old wooden structure, it wasn’t suitable for holding up steel. Reinforcement of the walkway footings took place last week, leaving trail paving as the last major task to be performed before the structures open to cyclists on the first day of June.